Fox Chandelier Cleaning, the premiere on-site chandelier cleaning service in the San Francisco Bay Area, is dedicated solely to the care, maintenance and restoration of chandeliers and light fixtures. Fox Chandelier Cleaning maintains the highest standards of excellence in the cleaning and care of your chandeliers and light fixtures. We pride ourselves in offering superior customer service, an exceptional eye for detail, and the utmost professional care and precision when servicing your chandeliers and light fixtures. We service both residential and commercial clients. Our specialized team of chandelier cleaners can tackle any project, big or small. With our extensive experience working on fine antiques as well as modern reproductions, we can brighten any chandelier and light fixture. Our crew of skilled chandelier cleaners has cleaned literally hundreds of thousands of crystals leaving a trail of sparkling lights throughout the San Francisco Bay Area. Over the past 15 years, Fox Chandelier Cleaning has assembled an extensive list of clients which include over 500 private homeowners, hotels, vineyards, restaurants, and retail establishments including The Fairmont Hotel, Saks Fifth Avenue, Cartier, Hotel Sofitel and many more. Along with chandelier cleaning, we also offer other chandelier and lighting services such as minor repairs, restoration, parts installation, parts assembly and unpacking. We utilize our skills in chandelier and lamp restoration and rewiring to ensure we clean each chandelier and light fixture with the utmost care and precision. Our crew of conscientious and skilled chandelier cleaners takes great pride in leaving a sparkling light in our clients' lives. Fox Chandelier Cleaning looks forward to working with you to make all your chandeliers sparkle! 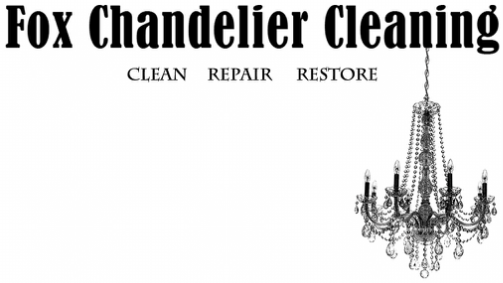 Fox Chandelier Cleaning is a woman-owned niche business owned and operated by Rebecca Fox. Rebecca’s background and experience working for Jessica Bodner at Bodner Chandeliers gave her extensive knowledge of chandeliers and light fixtures. While working at Bodner Chandeliers, Rebecca specialized in rewiring and repairing chandeliers and light fixtures, as well as fabricating custom chandeliers. After working at Bodner Chandeliers, Rebecca recognized that many chandeliers and light fixtures were not being maintained or properly cleaned, and therefore were not showing off their true brilliance. Realizing the need and demand for on-site chandelier cleaning, Rebecca established Fox Chandelier Cleaning in 2004. Rebecca brings all of the skills and knowledge she learned while at Bodner Chandeliers to Fox Chandelier Cleaning and has personally trained all of her employees passing on these valuable skills. Fox Chandelier Cleaning has grown to include employees that are highly talented chandelier cleaners, all of whom are artisans and craftspeople who are extremely professional and detail-oriented. Every member of the crew provides superior service, an exceptional eye for detail and the highest professionalism.